The definition of rehabilitation is to restore to good health or useful life. But the definition is far simpler than its execution. A person recovering from a stroke, joint replacement, or other illnesses or surgeries may need a variety of therapies: inpatient, outpatient, physical, occupational, and speech. It is Avi Amit’s job to see that people get the help they need to get back to the business of daily life. Avi manages the rehabilitation services for Olympia Medical Center at its newly remodeled location on the fourth floor at 5901 West Olympic Boulevard. This well-equipped facility, which offers dramatic views to the south, is where Avi and his team of therapists demonstrate their positive and compassionate attitudes for their work. It is obvious that they are deeply invested in achieving the best possible outcomes for their patients. This is where the variety of services they provide comes into play. An orthopedic procedure calls for physical therapy to restore a sense of balance and range of motion; a stroke or neurological incident might require speech therapy; some patients need to relearn functional activities like bathing, dressing themselves, or preparing a meal; and others will need a combination of all of these tools. This comprehensive approach requires a highly skilled team. The open design of the clinic allows easy interface between all of the specialists, yet provides privacy when needed for speech or certain physical therapies. 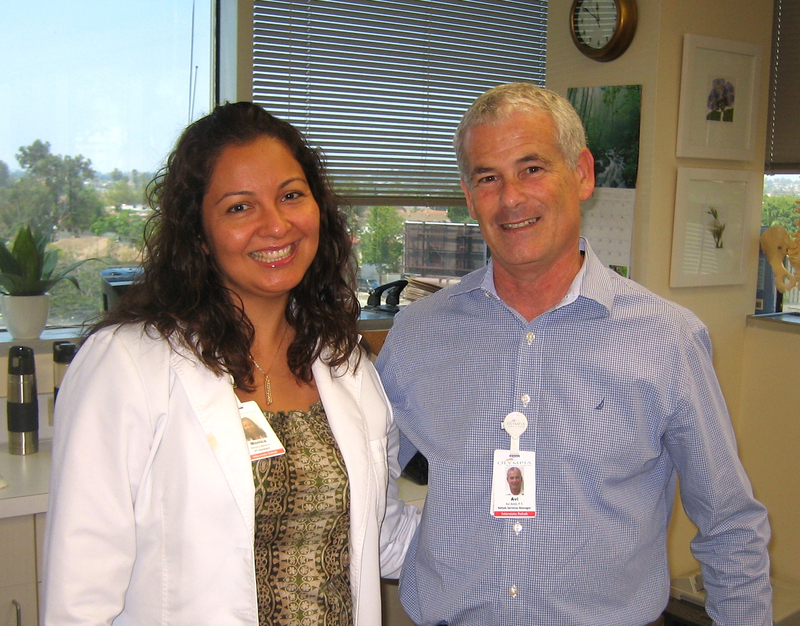 Monica Becerra, Physical Therapist Assistant, and Avi Amit. Their location and free parking is very attractive to residents of the Miracle Mile. For patients living within a ten mile radius they provide free transportation to-and-from the clinic – a valuable service for patients with conditions that prevent them from driving. The philosophy of Avi Amit and the staff at the Olympia Medical Center Rehabilitation Center can also be easily defined: They really care. This entry was posted in News and tagged Avi Amit, miracle mile, Miracle Mile Residential Association, mmra, occupational therapy, Olympia Medical Center, Olympia Medical Center Rehabilitation Services, physical therapy, speech therapy. Bookmark the permalink.